Unique Identification Authority of India (UIDAI) has given the chance to check Adhaar Card status check for newly enrolled candidates and who have submitted corrections and modification for Name Change, Date Birth, Address change in Aadhaar Card the candidates can check their application status from UIDAI Resident portal with submitting of EID or UID number or URN is absolutely used to check the status of Aadhaar card. The Citizen of India, who have Newly registered users those candidates can check their Aadhaar Status with entering EID number for issuing or generating of Aadhaar Number and the candidates who have submitted for changes to modify to Aadhaar Data Corrections they can check with URN ( Unique Registration Number) through Aadhaar self-service resident portal as for following simple steps..
Now you have seen following page, now enter the Enrollment ID, EID (1234/12345/12345),Date/Time (dd/mm/yyyy hh:mm:ss) and Enter Security Code, then click on check status option to display your aadhaar number generation details with dispatching of Aadhaar Card and you can download e-Aadhaar letter and carry mAadhaar through your mobile phone. Now you have Successfully checked your EID status and you can download e-Aadhaar with providing your enrollment ID details and take Aadhaar Card Printout. 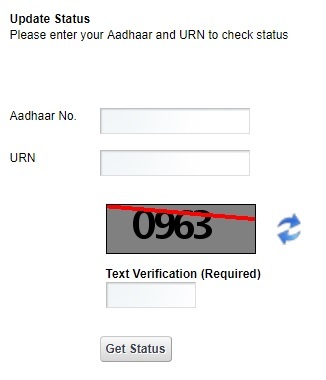 The Indian Citizen who have submitted for modifications to corrections of their Name Change, Date Birth, Adress change they can check their aadhaar update status with using their submitted correction application unique identification of URN number from Aadhaar Self Service Update Portal (SSUP) as per following steps. Now Enter Aadhaar 12 Digit Number and URN number and Text Verification then click on get status for know about your Aadhaar Update Status to approve your corrections. Now you have seen your Aadhaar Update Status, with modification details, if you have Successfully Approved changes you can download aadhaar card from UIDAI resident portal. I have Submitted Modification before a few weeks ago, but my URN status still pending What is the problem? UIDAI will get a huge number of modifications in a day, and the UIDAI will approve each modification after manual verification and the process will take time, in order, your URN will verify and Approve please wait its take time, if you have not updated successfully please visit nearest Aadhaar Center to re-update. I have lost my URN and how to check my correction status? The URN is a unique identification number for your submitted update or modification, without URN there is no possibility to check status on UIDAI SSUP, the URN will be sent to your registered mobile number please check again or wait your update status will be sent to your mobile phone through SMS. How can I know my Update request is Processed or not? Once the update has been successfully completed applicant can receive SMS through the mobile number, and you will get updated aadhaar letter and you can also download e-aadhaar card and get mobile aadhaar through mAadhaar App. Sir My name is Ragib Adnan.I want to download my aadhar card.